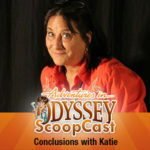 Our reviews on The Odyssey ScoopCast aren’t quite finished. Take a look at what’s in store for our latest edition of the podcast! The ScoopCast continues its review of “Life Expectancy” from Album 57: A Call to Something More. Special guest Josh Taylor from Blimey Cow continues with the team as they discuss Wooton’s comic relief, the meaning of life, and the overall impact of the episode.